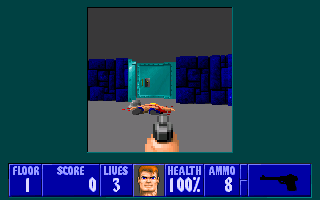 I've been working on a cut down port of Wolfenstein 3D for CD32, based on the "AWolf" source code (http://aminet.net/package/game/shoot/AWolf3D). As you can see I've taken a couple of liberties with the rendering (eg the viewport width), but I've managed to get it fast enough to be playable on a stock standard CD32. Also it's fully playable on just a stock controller. There's still a few rendering glitches to sort out, also I want to look at Sound and Music (there's none at the moment), registered version/Spear of Destiny support and rudimentary NVRam saving. This is my first Amiga dev project and my C is really bad, so I know I've made bit of a hack job of the source code. I'd appreciate any advice or suggestions at all. Last edited by earok; 13 June 2014 at 12:20. Nice to see another port of Wolf3D and for CD32. I'll try your version soon on my CD32. Cheers. I saw the Wolf3D port to Genesis and was impressed by what he had pulled off, actually I was kind of embarrassed that I couldn't get this port working as well as the Genesis one does. I tried it on real NTSC CD32 and it plays not bad. Just published two fixes to the source/iso (fix for screen tinting red after going back into the game from the menu, also fix for the AI occasionally being lethal). So far 286 is better, but its still early beat so I'm keeping finger. Cool idea to make Wolf 3D playable on CD32. Does it use Akiko?? Will it run on A1200, without expansions?? Last edited by tom256; 14 June 2014 at 09:01. How many more fps do you get using akiko? surely all the gfx data won't take up too much of the 2mb ram? Published yet another fix (hopefully the last for a week or so), it was running out of memory by the second or third level as each sprite was behind held in memory twice (once for the initial load and and once to "decompile" the shape). I've made it free the ram of the initial load after the decompile, so hopefully it now should be playable right through to Hans Grosse. It probably won't run on a basic A1200 as it does use Akiko's WriteChunkyPixels functions. If there's any demand for a version that works on a basic A1200 I could look into that - although the source for my version, AWolf (http://aminet.net/package/game/shoot/AWolf3D) should also work on a standard A1200, I was able to get that running on my CD32 as well (although I had to use halfnhalf to create fake fastram in order to get blazewcp working). Would this be able tun the registered version? Awesome! Great idea. Tried it on PAL CD32. Runs decent. It's playable. It has those slowdowns when accessing disc but I don't mind, I love ma ol' lady and she can take her time With sound and music it will be nice to play. Little bigger window if you manage to get with same fps would be great. And a minor thing for later fixes, if you already didn't notice by yourself, on real CD32 you can't get out from high score entry with joypad, obviously need keyboard. @kkgarbod it doesn't currently support the registered version, I tried compiling it with the registered version flag on and it loaded but the graphics were messed up, I'll need to look into why but I presume it's because the texture offsets are different between shareware and registered versions. @cobe thanks! I guess I didn't get any high scores I'll look into fixing that for the next release. Any advancements with this or is it not likely to get any speed improvements? It's already probably the fastest FPS on CD32 with a 1x1 resolution . I haven't touched the code in awhile and to be honest I made a mess of it trying to squeeze out every frame, I might have to start this from scratch someday. Oh, thank you for reviving this thread which I had completely missed! So many interesting things to try, so little time! From what I read in this thread, the game is still 100% C code? I am very tempted to give it a look but my own project moves slowly enough that I should really work on it first. Argh... Temptations! There was some assembly in the base code I used (I think for rendering the wall slices) but I threw it out, not because I thought I could optimise it better but because I was doing a bunch of nasty hacks to get the game to run smoother at the cost of graphical fidelity. I haven't had a chance to work on it lately and someone else could do a much better job making it cd32 friendly I'm sure. Maybe using the Gloom editor removing floor and ceiling textures would result in a faster Wolfenstein 'clone' not the ideal maybe. Do you have the source code available somewhere? Note that gasega68k does not make use of the full 64 colours of the MegaDrive/Genesis, only 16 are actually used with dithering which also halves the horizontal resolution. These two things give his version quite a boost. He has made the source code available so I guess we could compare. I've zoned the source, it's very rough (The tweaks were my first real Amiga C project and I wasn't finished). Oki, thanks for these details. If it is all C, then all the better, my assembly is way too rusty to be of use for the moment. I have a bit of work already "planned" on Catacombs 3D which I expect to be very similar technically to Wolf3D so I will first check if anything I thought about for the former can be applied to the latter. No promises on dates though, I have much to do before I even start looking at it.